Streptogramins are produced by streptomycetes and are classified as A or B compounds, based on their mechanism of action as outlined below. As a class, streptogramin A and B compounds are bacteriostatic when used separately. However, when used in combination, they can act in synergy to become bactericidal. They are active primarily against gram-positive bacteria. 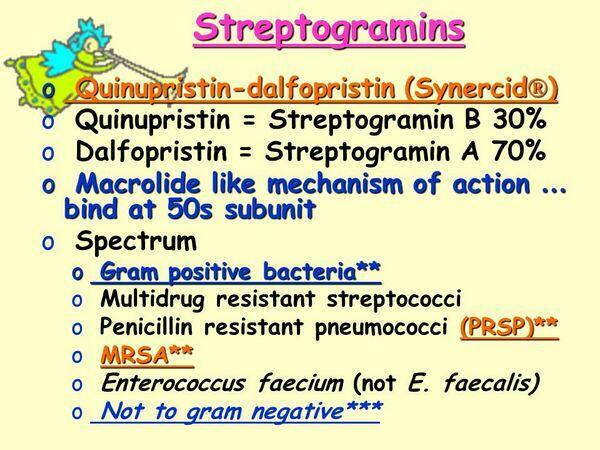 Streptogramin combinations are bactericidal (concentration-independent) against streptococci and staphylococci and are bacteriostatic against enterococci. 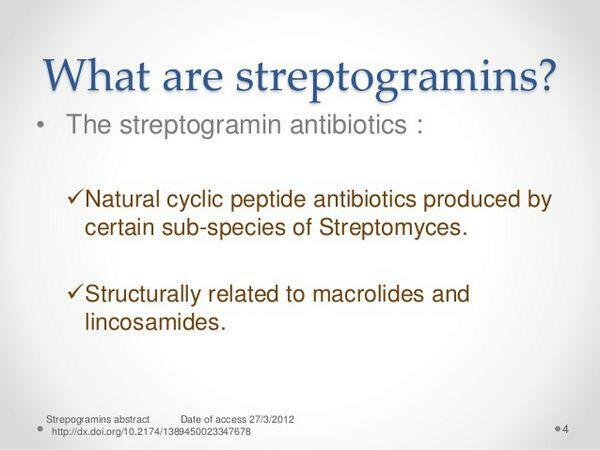 While streptogramins are expected to be used in treating serious nosocomial infections caused by antibiotic-resistant, gram-positive bacteria, these agents also have a potential role for the treatment of severe cases of acute exacerbations of chronic bronchitis in the hospital setting. 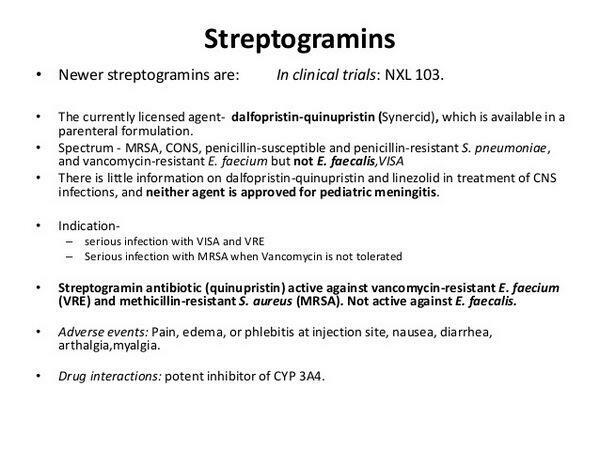 In particular, as the prevalence of multidrug-resistant gram-positive bacteria increases, the streptogramins could play an important role as second-line agents. Quinupristin/dalfopristin (King Pharmaceuticals/Sanofi-Aventis/Fujisawa's Synercid), the first globally available streptogramin, has proved effective in treating patients suffering from severe, multidrug-resistant bacterial infections. Streptogramins enter bacterial cells by diffusion and bind to different sites on the 50S ribosomal subunit to form a stable drug-ribosome-drug ternary complex resulting in an irreversible inhibition of protein synthesis. Streptogramin A inhibits peptide chain elongation, and streptogramin B inhibits peptide bond formation. The synergistic bactericidal effect of the combination appears to result from conformational changes brought about in the peptidyl transferase center. Sanofi-Aventis is developing XRP-2868*, an oral streptogramin combination consisting of 30% RPR-202868 (a type B streptogramin) and 70% RPR-132552 (a type A streptogramin) for the potential treatment of acute exacerbations of chronic bronchitis and other RTIs. In February 2004, XRP-2868 was in Phase I studies in the United States. In September 2003, preclinical data from a study of the synergistic activity of RPR-202868 and RPR-132552 against S. aureus, S. pneumoniae, and H. influenzae were presented at the 43rd ICAAC meeting. The compounds showed a synergistic bacteriostatic effect against S. aureus. Against S. pneumoniae, the compounds showed a marked synergistic bactericidal effect. RPR-132552 was bactericidal against H. influenzae alone at concentrations over 2 mg/L, while RPR-202868 showed minimal activity. In another study, the in vitro activity of RPR-202868 was compared with that of other antibacterial agents against S. pneumoniae and H. influenzae. Tested in 261 S. pneumoniae strains, XRP-2868 demonstrated potency similar to that of pristinamycin (Sanofi-Aventis's Pysotacine) and potency that is one to two times superior to that of quinupristin/dalfopristin. XRP-2868 also demonstrated superior potency against PRSP compared with azithromycin and clarithromycin. In addition, XRP-2868 demonstrated higher potency against H. influenzae when compared with azithromycin, clarithromycin, erythromycin, and pristinamycin.